Click here for a document describing the history of the Church. A board, part of which was cut from an oak tree that once stood in the churchyard, is located on the north wall of the church at the back of the nave. It lists (most of) the incumbents of St Michael & All Angels, or the chapels or church buildings which preceded the present one, since the first recorded secular priest, or "parson" in charge, named Jordan, in ca. 1210-1214. 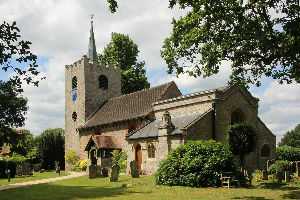 The Parish Church of Pirbright occupies a unique position, within the commuter belt for London, yet in a surprisingly rural setting: part of the green corridor for wildlife in the great metropolis. Surrounded by fields and close to woodland and heath, it provides a special environment within a range of ecosystems. It shelters a wide variety of wildlife including threatened species such as thrushes, bats and stag beetles whilst the stream on the South side is home to water voles and brook lampreys. But the churchyard is not merely a wildlife haven, more than that it stands testament to the glory God, representing the special relationship between Man and God, which has been celebrated on this site for almost a thousand years. Magnificent specimen trees speak of the glory of God; planted carpets of snowdrops, crocus and bluebells tell of His bounty; tombs, from humble wooden bedsteads and brick arches to a huge granite monolith, serve as reminders of mortality and of hope for a future in God. Family names on memorials and initials of long past churchwardens, carved into the bricks of the church, link the building and the churchyard with the people of our community through the ages. 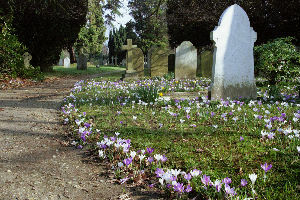 It is as a garden to the glory of God that the churchyard has a special place in the community, visited by churchgoers, children from the local primary school, families tending graves, walkers and people simply seeking a moment of quiet communion. 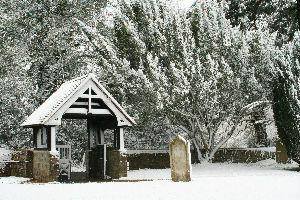 Twenty years ago the churchyard was an overgrown tangle of brambles, rhododendrons and weed trees. Together the PCC, individuals in the community and a regular working party have gradually restored and maintained the grounds, clearing undergrowth and uncovering lost graves, sweeping mountains of leaves, planting spring bulbs and flowerbeds and installing seats for quiet meditation. The local agricultural college advised in the care and restoration of trees; uneven and flooded footpaths were gravelled and wheelchair access and low level lighting installed. We have installed a new footpath in order to extend access for pushchairs, wheelchairs and those less steady on their feet. There is always more to be done!